Little Brodie is 16 weeks old and of course Wally turned 16 years old in April. 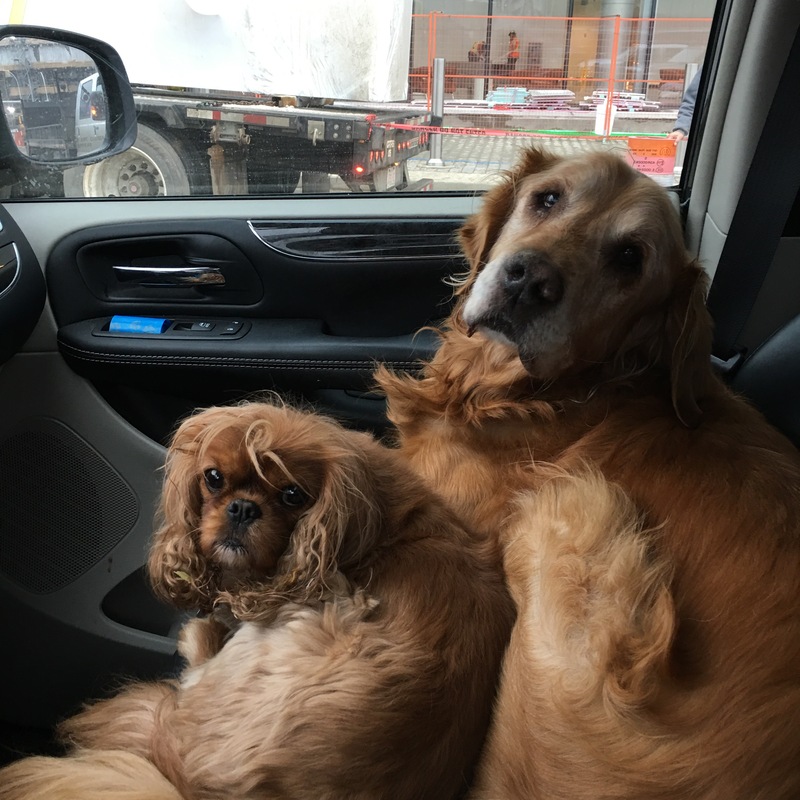 They may look very different, my old man is a rich copper and the other is a silky, soft, creamy white but they are both gentle, sweet souls…..true Goldens !!! Our little golden boy Brodie is 3 months old today. He is growing so fast. He has more than doubled his weight in the month that we’ve had him. No matter how bad he is, I just take one look at that face and my heart melts. Our little Brodie is settling in nicely. He is a little afraid of Spirit’s larger than life personality and is very respectful of my beautiful oldie Goldie Wally. Unfortunately he is like an unruly, annoying little brother with poor little Tilly. We have to keep rescuing her from his grip. I can’t stop taking pictures of his sweet little face. Each image is cuter than the last. As a thank you to my Golden Valentine we went for a walk (just Mom and her boy) to Tim Hortons to get him his favourite treat. He usually only gets a Timbit but today we went for the whole donut. I love it when we can start our mornings out on the deck enjoying our morning coffee/tea together. On Sunday I attended the graduation of one of Wally’s children. I have a very special spot in my heart for Garnet. Of the 51 puppies that Wally’s sired, he is the only one that really looks like his Dad. He spent the first few years of his working life as a guide dog for a wonderful gentleman. Sadly he passed away suddenly and Garnet was returned to the school. They decided that he was too young to retire so they retrained him and placed him with a psychologist to act as a therapy dog for her clients. Garnet is 7 years old now and watching him and his mannerisms….OMG he is definitely his Daddy’s boy. He has the same loving and gentle personality. Here is a picture of the whole graduating class. Garnet’s beautiful deep golden colour makes him stand out in the group….”one of these is not like the others”. When they arrived, Garnet’s nose went up and he started air scenting and wagging his tail wildly. He knew we were there and he was excited. I was able to get up close and snuggle with my beautiful grand-puppy. Isn’t he just beautiful. A blast from the past…..in 2010 we had this photo taken (courtesy of Laughing Dog) of Wally and Garnet just before Garnet went into final training to be a guide dog.